Japan has been struggling with weak economic growth for decades, and political leaders are preparing for a fresh round of fiscal stimulus. Previous attempts to increase economic growth through spending stimulus have not produced the sustainable growth promised by the government. As an alternative, Japan could attempt growth-promoting tax reform, such as reduced tax rates on business income, shorter asset lives for consumption allowances, increased consumption taxes, and the removal of certain provisions in the tax code that dis-incentivize female labor force participation. A combination of weak domestic demand, and a strengthened yen hurting exports, has led to a decline in domestic and international consumption of Japanese goods. In addition, Japan faces many demographic challenges, including a rapidly aging population, a declining birthrate, and the under-participation of women in the workforce. Finally, in 2015, Japan’s gross government debt was an astounding 226 percent of GDP, the highest in the OECD. While this is mostly due to rising social spending, it is exacerbated by insufficient revenues. Even though the majority of this debt is held by the domestic market and the Bank of Japan, this problem will only continue to grow as debt service costs continue to rise. Yet another stimulus package will be insufficient to address these problems; Japan should redouble its efforts to fix the tax code and address structural issues. In addition, the package includes monetary stimulus in the form of boosting stock market purchases, as well as other undertakings, such as public-private partnerships that are not direct government outlays. This is not the first large stimulus package Japan has introduced – it is the 26th fiscal stimulus package introduced since the 1990s. Japan has paired many of these stimulus packages with unorthodox monetary policy, including zero and negative interest rates, and quantitative easing. 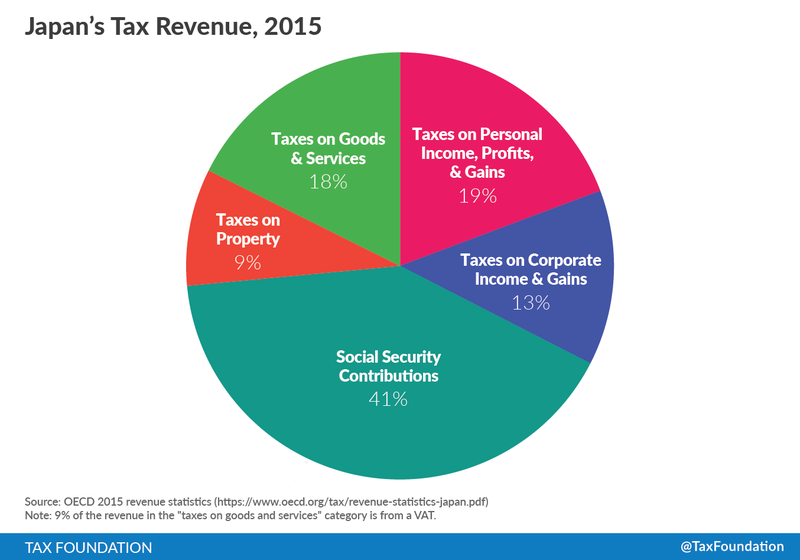 In 2015, Japan derived 41 percent of its tax revenue from social security contributions. However, the revenue gained from social security contributions is especially troubling, because this revenue goes directly into funding the pension system, health services, and personal social services. As Japan’s society continues to grey, Japan will have to keep raising rates on the shrinking working population in order to fund more of these services. 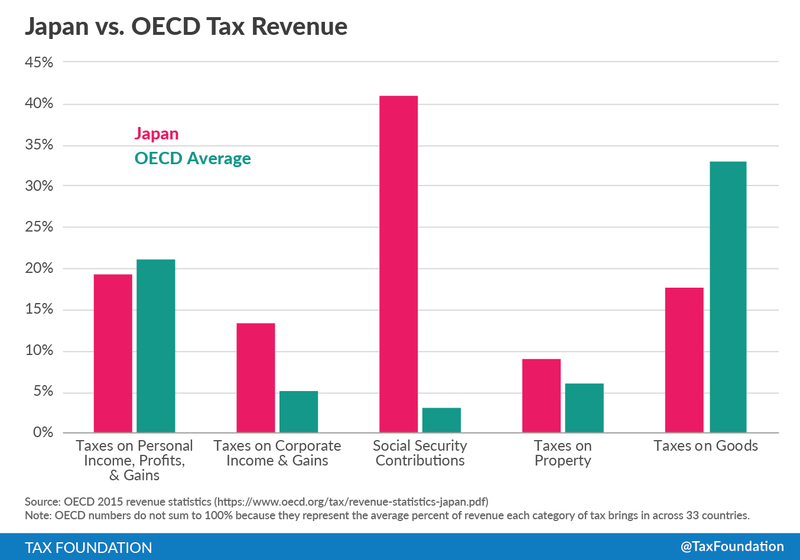 In contrast to the OECD average of 33 percent, Japan received 18 percent of tax revenue from taxes on goods and services, 9 percent from the VAT (value-added tax). The current VAT rate is 8 percent, comprised of 6.3 percent national and 1.7 percent local tax. The last increase in the VAT was in 2013, increasing it from 5 percent to its present level. An increase to 10 percent (7.8 percent national, 2.2 percent local) was scheduled, then subsequently delayed to April 2017, then recently delayed even further to October 2019. This is not an across-the-board increase, however. Japan will introduce a reduced VAT rate of 8 percent for newspapers publishing at least two times a week, and food and beverages excluding dining out and alcohol. On the corporate side, Japan recently passed the 2016 Tax Reform Act, reducing the combined national and local corporate tax rate from 32.11 percent in fiscal year 2015 to 29.97 percent in fiscal years 2016 and 2017, with an eventual reduction to 29.74 percent in fiscal year 2018. The proposed tax cut is covered by changing the depreciation of structures and attachments to buildings from declining-balance to straight-line and reducing the amount of losses that can be deducted. Although these changes recapture revenue from reducing the corporate tax rate, these types of provisions tend to increase the cost of capital, negating the growth effects from reducing the corporate tax rate. In 2015 Japan received 19 percent of its tax revenue from taxes on personal income, profits, and gains. Japan’s personal income tax system is complicated, with provisions determining which type of income can be taxed for people who are residents, non-permanent residents, and non-residents. Among those three categories, people are taxed at marginal rates of between 5 and 45 percent. Lowering the corporate income tax and personal income tax, and raising the consumption tax, would be a partial solution to many of Japan’s revenue and economic problems. To partially make up for lost revenue and promote economic growth, in addition to raising the consumption tax, Japan should remove the provisions in the tax code that dis-incentivize female labor force participation, which would encourage greater labor participation rates. The most hurtful of these provisions discouraging female labor force participation is called the “Wall of 1.03 Million Yen” (approximately US$10,100), referencing the maximum income the lower-income spouse can earn in order for a household to take full advantage of the Japanese income tax’s spousal exemption. When filing, most single or married wage earners can take advantage of a US$6,400 on salaried income as well as the US$3,700 basic exemption. However, if the lower-earning spouse earns less than US$10,100, the spouse with the higher-income can claim an additional spousal exemption of US$3,725. There is evidence confirming that this spousal exemption discourages many women from seeking higher-paid jobs, or working additional hours that would raise their income above US$10,100. Taxes on consumption tend to encourage savings and investment, which can decrease the price of capital. As illustrated in the Tax Foundation’s recent publication “Options for Reforming America’s Tax Code,” a small business owner who earns US$250,000 in sales, spends US$200,000 of it on an investment, and consumes the remaining US$50,000 would pay taxes on both the US$50,000 of consumption and the US$200,000 increase in wealth under an income-based tax. However, under a consumption-based tax, the business owner would only pay taxes on the US$50,000 of consumption, and would not pay taxes on the investment until it yields a profit in the future. Therefore, consumption-based taxes avoid the double-taxation of saving and investment, and would theoretically make the business owner more likely to invest. In addition, Japan’s current consumption tax is very low compared to the OECD average of 19.2 percent. However, it is difficult for Japan to undertake tax reform because raising the consumption tax is politically unpopular. Consumption in Japan has seen negative growth in the past three years, and the Japanese government is under pressure to continuously raise revenue to combat its ever-growing deficit. While the scheduled consumption tax increase is a good step in the right direction, the dual-rate system introduced by exemption for certain foods, beverages, and newspapers narrows the taxable base and increases compliance costs. Japan’s economy has not responded to the standard stimulus tools used by governments. Experimental monetary policy and fiscal stimulus alone have not produced economic growth. It’s time that Japan takes a serious look at its tax code with the purpose of conducting revenue-neutral tax reform that will boost long-term economic growth.